Rev. 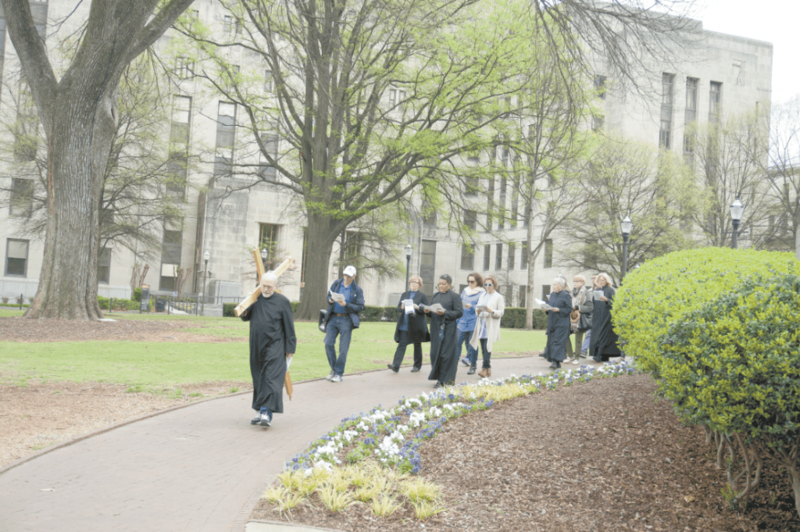 Dr. Mark LaGory of St. Luke’s Episcopal Church leads the annual Stations of the Cross: Seeking the Suffering of Jesus on the Streets of Birmingham, a mini-pilgrimage held on Good Friday which combines traditional Christian devotion with social justice themes in downtown Birmingham. Photos courtesy Rev. Kelley Hudlow. While April 21 will be a celebration of faith for Christians as they recognize Easter Sunday and the resurrection of Jesus Christ, for many April 19 is a day of quiet contemplation in recognition of Good Friday. The liturgical holiday focuses on the crucifixion of Jesus and his death at Calvary and is represented through the Stations of the Cross, a mini-pilgrimage that consists of 12 or 14 devotions that represent struggles Jesus faced during his last day on Earth as a man. Rather than coordinating a traditional ceremony, the downtown event is infused with a social justice theme. 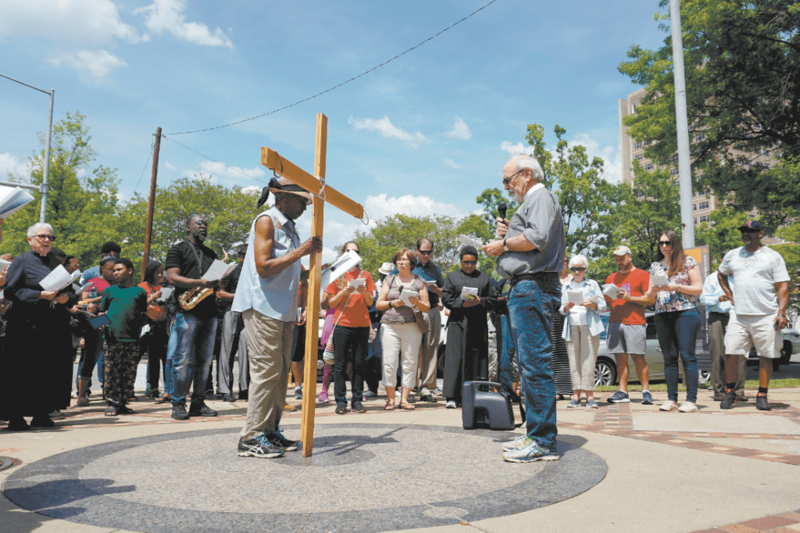 “The idea is to take these everyday pieces of the downtown area – particularly the Civil Rights district – and connect them to the experience of Jesus on Good Friday,” said the Rev. Mark LaGory, a deacon at St. Luke’s. The marriage of sociological and theological aspects mirrors LaGory’s life. He worked as a sociologist for 30 years, including serving as the chair of the sociology department at UAB. When it came time to retire, he became ordained as an Episcopal deacon and started working full time at St. Luke’s, focusing on outreach including events such as the Stations of the Cross. LaGory spearheaded the development of the event, inspired by past ceremonies he had experienced. Many years ago, a group of ministers hosted an informal ceremony downtown, but it wasn’t until the archdeacon for the Episcopal Diocese of Alabama hosted one that LaGory began developing the event. “I saw what the archdeacon had done for our clergy group, and I thought, we could do this in the stage of the downtown area – particularly in the civil rights district – because there is a lot of sacred ground out there in Birmingham where a lot of history took place,” he said. At the heart of the scriptural element of the ceremony is Matthew 25, particularly the portion that focuses on right attitude leading to right action. Fourteen landmarks and areas in downtown Birmingham serve as stops along the walk, each representing a form of suffering representative of the suffering outlined in each of the traditional stations. “The idea is to take each station, being about someone who is suffering, and see this as Jesus saying, ‘When you suffer, I suffer,’” he said. LaGory chose Linn Park as the starting point because it is a space familiar to the diocese, which hosts a service each Wednesday for the homeless called Church in the Park. From the park, participants walk either in song or in silence and make their way through the remaining 13 stops. There are stops at historical landmarks such as 16th Street Baptist Church and at places as simple as a bus stop, praying for those in need of transportation. The last station is at Four Spirits in Kelly Ingram Park, a monument to the four young girls who were victims of the 1963 bombing of 16th Street Baptist Church. “The idea behind that station is pretty moving … it represents Jesus being laid in the tomb, and there we are praying for innocent victims of violent actions,” LaGory said. About 70 people participated in last year’s walk, which is attended by people from a variety of faith backgrounds. The ceremony is co-sponsored by the Greater Birmingham Ministries and includes participation from local Baptist churches and the FirstPresbyterian Church, as well. “It’s not just a bunch of Episcopalians walking the stations,” LaGory said. “We have Baptists. We have some homeless people who walk with us. “We all have similar faith beliefs, but not necessarily the same liturgy. This brings us all together, on Good Friday particularly, to see the suffering of others,” he said. The former dean of St. James Cathedral in Chicago joined the walk and felt inspired to begin coordinating a similar event in her parish. “People that have done it say that it is one of the more meaningful experiences they’ve had on Good Friday because it is relevant to today,” LaGory said. You don’t have to be a person of faith to be moved by experiences such as walking through the snarling dogs monument or passing the plaque at the entry of Kelly Ingram Park and reading “Place of Revolution and Change,” he added. “The other thing that happens is that people see the city and their downtown in a different way by making a connection with, perhaps, their faith,” LaGory said. The Stations of the Cross: Seeking the Suffering of Jesus on the Streets of Birmingham will begin April 19 at noon by the fountain in Linn Park. Comfortable walking shoes are suggested. For more information, visit saint-lukes.com.